See also: "Courier Mail spins news of 79% opposition to fire sale to reveal its privatisation colours" of 11 Dec 09, "Queensland Rail workers strike against theft of public assets" of 9 Dec 09, "Brisbane ABC suppresses alternative candidates in state elections despite listener dismay with major parties" of 30 Apr 09, "Media contempt for facts in NSW electricity privatisation debate" of 28 Sep 08. Why I am contesting the Queensland Elections, E-petition to Qld Parliament,"Call for immediate resignation of the Queensland government and new elections," on grounds of not consulting public on privatisation. Update: Letter of 31 July 09 to Andrew Fraser, included as Appendix 1 (12 Dec 09), Full transcript, Table of Contents, etc. added (2 Jan 10). This article was orignally published on 4 Dec 09. It was subsequently updated with the letter to Andrew Fraser of 31 Jul 09 which propsed alternatives to privatisation on 11 Dec 09. The latest update of 2 Jan 10 includes the full transcript of the videos, together with comments, a table of contents, and other additions and changes. Image from Sheila Newman's film of the 30 Nov 09 debate between Andrew Fraser and James Sinnamon to which there are links below in the article. On Sunday, 30 November, almost 4 months after I had e-mailed state Treasurer Andrew Fraser proposing alternatives to the $15 billion of asset sales (see Appendix 1), and 9 months after I had e-mailed both the Treasurer and the Premier requesting that they reveal to the public any plans for privatisation and justify them during the course of the elections, I was able to confront the state Treasurer during a 15 minute interview at the Community Cabinet. The following film, divided into three parts, is a record of that interview, which turned out to be quite a debate. The full transcript of the debate is included below as Appendix 2. You can access the three parts of the film on this page, but, most people will find the first part boring, unless they are looking for documentation of the lead-up to the debate. I suggest you go to Part 2 for arguments about alternatives to privatisation - notably on banking systems - and to Part 3 for arguments about why Queensland's population is growing irresistibly and whether that is a valid excuse for privatisation. The first part of the film consists of Andrew seeming to insist that we had debated together already and that he had answered my correspondence. I try to tell him that he responded to one email only - up until the invitation to meet him at the Community Cabinet - and that it was that response which confirmed my impression that, prior to winning the election, he was leaving privatisation of assets open; i.e. he was not excluding it. Andrew's answer to that is that the government did not know what its policy would be after the election. I maintain that it was well-known that population growth was costing the government money and that the government should have made clear to the public that there was a problem and that privatisation was not ruled out. Although it was the duty of the mainstream press to ferret this attitude out, it was also the duty of the government and the opposition to publicly discuss the problem of debt and the range of solutions ahead of the election. At one stage Andrew remarked that the whole world and the press were free to attend the small public question and answer session/meet the candidates affair that he describes as a debate we both attended. I reply that the press chose not to come. In other circumstances I might have emphasised 'chose'. Because, of course, my point is that the mainstream press have apparently colluded with the two party system to help them avoid publicly discussing the privatisation issue. See Privatisation and the Right to Govern, Part 1. Go to transcript. Go to unembedded YouTube copy. Not only did I raise the privatisation issue, but I also raised alternatives to privatisation. The main one I discussed was for the government to set up a state bank and guarantee its own loans, rather than to go looking for forms of private credit. My reference was a book by Ellen Brown, Web of Debt. This was the source of the system that I had asked Andrew or his department - Treasury in Queensland - to give me a written critique of. If what I proposed was wrong, then, fair enough. I was prepared to learn. But I received no answer from treasury and, in the debate, the treasurer tries twice inaccurately to insinuate that I am proposing to have no ceiling on debt, then simply accepts my proposal as another way of raising money and does not contradict my assertion that it would be a cheaper way. You will find this discussion in Part 2 of Privatisation and the Right to Govern. One of the alternatives to privatisation that I raised was for the government to stop encouraging population growth. Andrew gave what some tell me is the property developer shock-factor line on this - he insinuated that stopping population growth in Queensland would be akin to stopping Mexicans coming across the Southern Border of the U.S.. He used the term, "Checkpoint Charlie", and you will get the drift of some fantasy about uniformed guns patrolling the Tweed River. He also immediately pretends that I population growth reduction would inevitably include authoritarian controls over numbers of children per family in Australia. He was painting an extreme scenario, which could have had the effect of making me back down and away from the issue of population growth, but I didn't. At the stage we are at the only limits need to be on international immigration and construction permits. On the issue of limiting interstate immigration, I should just have said to him that population growth is normally restrained locally by limiting the number of building permits issued. It is a normal function of town and country planning, and you would expect a state as planning-focused as Queensland, not to need to be told that. Restricting building permits goes hand in hand with the democracy of local government, where residents - i.e. members of a community - have the ultimate say over the density of settlement and how their environment is treated. They know best and they have to live there. So, no guns or patrols are necessary, just good old tried-and-true keeping building permits to a level that keeps the population stable. 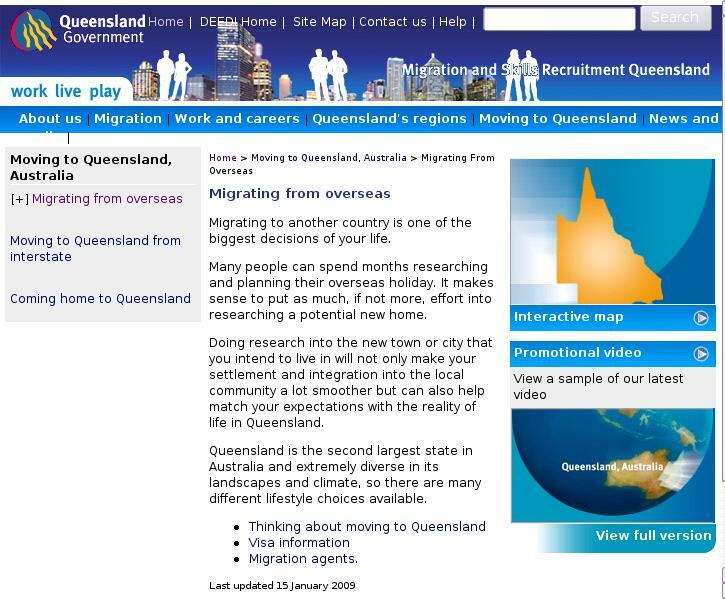 This is a captured image of the Queensland Government web-site explicitly encouraging people from overseas to move to Queensland as of 2 January 2010. This is completely contrary to Andrew Fraser's claim made during the debate that "We're not encouraging population growth". Australians should be very aware of how the Federal and the State governments- which are all aligned with the growth lobby - and even most local ones - have this agressive formula for putting people off discussing the problem they have created, and of how they will insist that it is not of their own making, even in the face of abundant evidence. This is discussed in the last part of the YouTube video "Privatisation and the Right to Govern, Part 3," embedded below. On 21 March 2009 the Queensland Labor Government was re-elected at the end of a snap early election campaign with little scrutiny by the newsmedia. As an independent candidate, I tried, during the course of those elections, to hold the government to account for its past record of selling off publicly-owned assets without any electoral mandate. Since 1998, the Labor Government had sold off the state Government Insurance Office Government, airports, a lottery agency, the retail arm of the state owned electricity supplier, a coal loader and much public land. I also asked for an assurance that the Queensland public would be informed of any further plans to sell off assets during the course of the elections. "The reason I write this letter is to seek your assurance that if you do intend to privatise any of these assets that you state your intention to do so to the public before the forthcoming elections ..."
The letter was ignored, along with my subsequent correspondence. My strenuous efforts to obtain air time, or, at least, to get the media to raise this issue were almost entirely ignored. When the Queensland Government, barely two months after their re-election, announced plans to sell ports, a coal loader, the freight arm of Queensland Rail, commercial forests and toll roads, most Queenslanders felt outraged. An opinon poll revealed that 84% of Queenslanders opposed the sale and 66% believed that the Government had intentionally misled them about privatisation during the elections. The Queensland Government proceeded with its fire sale regardless. Setting up a state owned bank to raise the necessary loans to fund infrastructure projects more cheaply than could be done with private loans. If the state owned bank is not to be created, then raise the commercial loans necessary to cover the shortfall, which would still have to be cheaper in the long term, anyway. To Implement, at the state level, the comprehensive University of Newcastle Centre of Full Employment and Equity (CofFEE) program. This program is fully costed, Australia-wide, at $9 billion per annum and would provide gainful employment to all the unemployed to meet the current needs of existing Australians, This would be a vastly cheaper alternative to the environmentally destructive infrastructure and housing construction juggernaut. Andrew Fraser ignored this e-mail and my repeated subsequent attempts to have a meeting with him in order to discuss his proposals. On 21 November, during a discussion on Madonna King's program, Andrew Fraser repeated the claim that no alternatives to privatisation had been offered inside or outside of Parliament. This moved me to contact both the ABC and Andrew Fraser to ask that that misleading statement be corrected and to again request an interview with Andrew Fraser. Late on the Afternoon of 28 November I was informed in a voice message that a 15 minute interview at the Queensland Government Community Cabinet consultations on Sunday 30 November had been granted. I was not able to prepare himself as well as I had hoped for the ensuing interview, which was filmed, and I made some mistakes during the course of the discussion. Nevertheless, despite its weaknesses, that interview is the single most comprehensive debate with the Treasurer on privatisation recorded on any newsmedia. The only other broadcast 'debate' was a short conversation between Andrew Faser and economist Professor John Quiggin on Brisbane's ABC local radio station on Friday 28 November lasting all of five minutes. The ABC has, so far, failed to make a recording of that debate available. At my meeting with Fraser, recorded on film, I still received no written response from Treasury, despite all the resources it has and the almost four months time which had elapsed. Also, neither Andrew Fraser nor the ABC have corrected the misleading statement that no alternatives to privatisation have been offered. I hope that people will use this record as a resource to bring the Bligh government under control and/or to inspire future political candidates. I will be standing in the next Federal election myself, and this will be one of my important platforms. See also: "Courier Mail spins news of 79% opposition to fire sale to reveal its privatisation colours" of 11 Dec 09, "Queensland Rail workers strike against theft of public assets" of 9 Dec 09, "Brisbane ABC suppresses alternative candidates in state elections despite listener dismay with major parties" of 30 Apr 09, "Media contempt for facts in NSW electricity privatisation debate" of 28 Sep 08. Appendix 1 - Letter proposing alternatives to privatisation. You stated on ABC 612 Radio's Party Games a fortnight ago (I think) is that no-one had put to you alternatives to privatisation. In fact, I think there are a many alternatives that would make unnecessary the $14 billion privatisation program, opposed by 84% of Queenslanders according to one opinion poll. I would like at the meeting to put to you those alternatives, in case they had not already occurred to you, or else learn from you the reasons why you have not adopted those alternatives, if you have considered them. I would also like to share this dialogue with the broader public. If, after our meeting, you remain determined to persist with privatisation, and are confident in your case, then you would surely agree that this would be to your advantage. A number of my suggestions are within the power of the Queensland Government to implement, whilst a few others could be implemented by Federal Government if the Queensland Government were to present its case publicly and assertively. I can guarantee that all of the alternatives I intend to put would be far more acceptable to his constituency than continuing to sell off the family farm. A state bank could be used to raise the necessary credit to fund any necessary infrastructure. This could be done at far less cost than raising funds through private banks. A state bank has been used successfully by North Dakota in the United States since 1919. Currently it is only one of two States in the US which is still solvent. Ellen Brown, who has extensive knowledge of banking systems in the US and elsewhere has proposed that the North Dakota model be used as a basis for the solution in California. I have yet to see the flaws in Ellen Brown's case. Of course, California still faces serious problems of water shortage, which are being exacerbated by population growth (as does Queensland - see below and see "Crazy From The Heat: An overcrowded California is running out of water and leadership" at http://www.capsweb.org/content.php?id=690&menu_id=8), but California would stand a much greater chance of getting on top of its ecological problems if it followed Ellen Brown's advice. I am sure that Ellen Brown would be willing to advise you how to get Queensland out of its financial mess for a cost to Queensland taxpayers vastly less than the $200 millon cost of hiring Merrill Lynch and the Bank of Scotland for advice on how to sell our assets, or if she is too busy, I am sure she would be able to recommend others who could, possibly even from Australia. As Dorothy Pratt pointed out in her speech in Parliament on 18 June out the $14 billion that Queenslanders stand to gain from the asset sales is trivial compared with the eventual $85 billion deficit that Queensland is expected to incur. What, then, is the practical difference between $85 billion and $99 billion (less the enormous overheads, including the abovementioned $200 million incurred in privatisation) if in the latter case Queenslanders retain democratic control of so many of our assets and the income streams? Also, what guarantee is that the ratings agencies won't next year demand that the debt be reduced from $85 billion in order to retain Queensland's AAA rating? What guarantee do we have that the same arguments won't be put to justify the sale of our power stations, remaining ports, and water infrastructure? And in any case, why should anyone pay any regard to what ratings agencies think, given their infamous role in having caused the global financial meltdown? It has been well established by economists like John Quiggin that the benefits obtained by reducing debt almost never outweigh the loss to society of losing valuable assets. The claim that private investors are somehow more efficient than Governments has been shown again and again to be nonsense. If anything the reverse is the case. Where figures have been produced that 'prove' greater efficiency, they invariably ignore the shifting of costs onto the broader community by the private investor. If all these were to be fully costed, we almost always find that large Government enterprises, particularly in natural monopolies, are more efficient. Clearly, Queenslanders stand to lose massively and if privatisation is the means adopted to reduce debt. In April 2007, then deputy Premier Anna Bligh defended population growth (explicitly encouraged by your Government by a full-page advertisement placed in the Courier Mail of 8 December 2005) implying that it was necessary to keep people in the construction industry employed. So, according to Anna Bligh, we are deliberately crowding ever more people into South East Queensland, which has insufficient water reserves to cope with a prolonged drought. This is why we face impossible congestion on our roads, and it is supposedly to fix this problem that communities all over Brisbane are being destroyed. The clearing of habitat in order to house additional people is why the Koala may well be extinct in South East Queensland in two years. We are all paying ever greater rates, water and electricity and gas charges, tolls in order to pay the cost of building additional infrastructure. As you rightly pointed out a fortnight ago on the abovementioned "Party Games" it costs far more to build necessary additional infrastructure in established areas than in new areas. On top of that, in a letter sent to me on 19 June, Premier Anna Bligh stated as a justification for the fire sale, "... a State with a rapidly growing population can't afford to ease off building the infrastructure that supports our economy and community." So, according to the Premier Queenslanders are expected to pay by selling off the family silver for population growth that we didn't ask for in the first place. To inflict all this upon Queenslanders in order to keep construction workers employed is insane. At some point, before Queensland becomes as crowded as Rwanda was in 1994, this will have to stop and, according to Anna Bligh's logic, those workers will lose their jobs anyway. Why not, instead, take the truly 'tough' decisions today? Why not implement this at a state level in order to wean us off our dependence upon socially and environmentally destructive housing and infrastructure building, for which we are now being made to pay with our rail forests, ports and roads, according to the Premier? I look forward to discussing all of this with you in person at our meeting. This transcript was created by film maker Sheila Newman in the process of producing the three part YouTube video. All is included including some of the more clumsy parts of my own contribution. This was not me at my best. I know I have been a more effective speaker on a number of other occasions. Nevertheless, this interview remains the most substantial and sustained public challenge to Andrew Fraser on privatisation of which I am aware, that is, outside of State Parliament. Although a number of good speeches were made against privatisation by Independents and Liberal National Party members, they were not reported by the media. I have added comments where I believe they would help clarify the issues. JAMES SINNAMON: ... email on the 31st of July... in fact I wanted to actually debate alternatives even before the election. That's why I wanted to have a debate with you and Anna Bligh about - or at least see a debate between you and Anna Bligh and someone who's competent to discuss privatisation. ANDREW FRASER: You and I did participate in a public debate during the election campaign. JAMES SINNAMON: Well ...I'm not quite sure what you're referring to. FRASER: It was a candidates' forum that you and I were both present at, James. FRASER: There was questioning from the floor and it was organised by an independent agency, not organised by me. SINNAMON: It wasn't a debate. You know it was not. I didn't have a chance to respond to you. FRASER: I'm pretty sure I turned up and there was a debate between candidates and all four candidates were there so let's not pretend something didn't happen that happened. SINNAMON: That was a debate between about 40 people. It wasn't a debate between ... ah, you know, the public. A whole lot of people that voted in that election had no idea that um, what was going to be at stake, the further sell-off of 14 billion of their assets. And, polls indicate quite clearly that a hell of a lot of people didn't know that that was on the cards, what was on the table. And the reason I raise this is that I think that people who are the owners of those assets - had every right, every entitlement - to know, firstly, that it was on the table and, secondly, to have the people that were in favour of privatisation put the ... defend ... put the arguments for, and those that are against privatisation put the arguments against it, and have the public decide. Have the public decide which ... whether, privatisation is necessary and whether they'd vote for a pro-privatisation candidate or an anti-privatisation candidate. FRASER: I've written back to you. FRASER: The media were free to attend. It was an open debate. SINNAMON. Yes, and they chose not to. FRASER: Secondly, I replied to your letter and other correspondence. very plain fact that we did all those things. FRASER: Well, as I said really clearly during the election campaign, James, there were going to be tough choices that we had to face, and we've had to face those. Comment: This is the critical point under dispute. The implicit claim being made by Andrew Fraser and the rest of the Queensland Government is that, in spite of Queenslanders' overwhelming repudiation of privatisation in the opinion polls and in spite of their continuing unpopularity, they somehow truly want the Queensland Government to push ahead with the "tough decisions" that it truly knows better than Queenslanders themselves know are truly good for Queenslanders. A similar argument was put by Imre Saluzinsky, the Australian newspaper's chief pro-privatisation propagandist during the Iemma Government's ultimately failed attempt to flog of NSW's electricity generators in 2008 (see "Media contempt for facts in NSW electricity privatisation debate" of 18 Sep 08). It is vitally important the the Queensland public make it explicitly known that they reject the implication that deep down they really want the Queensland Government to push ahead with all these "tough decisions" in the face of their overwhelming objections. That is why I have set up a Queensland Parliamentary e-petition which calls upon the Queensland Government to resign, for private investors not to buy the assets on offer and and for any future Queensland Government that enjoys the trust of the Queensland Government to not honour any sale contracts entered into. Some more information about the e-petition can be found in the "Anti-privatisation e-petition calls on Queensland government to resign" of 3 Dec 09. FRASER: We did not make that decision about what we needed to do in terms of a budget. SINNAMON: The Courier Mail said that you were just looking for a good ..."it's a shame to waste a good crisis" ...[unintelligible] That's the Courier Mail, 21st of October 2009. I haven't heard your response to that. FRASER: I'm happy to have a look at what you're suggesting. [Mr Fraser looked at the article.] That's an unnamed source about a meeting between the QC unions and the government and, I think you can safely presume that was something that was said by the QC unions, not by the government, so they can choose to defend that statement, rather than me. FRASER: I'm happy, I'm happy to defend things from the government, but the other people can defend their unnamed sources. Comment: This was obviously could have been handled better by me. The point remains that the comment implying that the crisis was an excuse, rather than the reason for privatisation in a major article in the Courier-Mail newspaper was not repudiated by the Queensland Government. Naomi Klein's "The Shock Doctrine" of 2007, a copy of which I am shown holding onto in the interview, shows numerous examples of crises being used as an excuses to impose programs of privatisation and Government austerity. An example of a crisis being deliberately created as an excuse for cutbacks to social spending is the phony debt crisis in Canada in 1993. That is described on pages 257-259 of "The Shock Doctrine". Suspiciously, the initial reason given for the Queensland fire sale was that the floods of May 2009, coming on top of a number of other natural catastrophes thoughout the previous 12 months, was the straw that had broken the camel's back. This pretext has since been dropped, perhaps, because it may have been too reminiscent of the infamous abuse of the Boxing Day 2004 Tsunami or Hurricane Katrina by Governments to impose similar fire-sale programs as well as social spending cut-backs. The sole excuse of the Government is the Global Financial Crisis. SINNAMON: The fact is that you didn't raise the issue. You didn't respond to my asking you to debate the issue. FRASER: I did attend the candidates' debate with you, James. SINNAMON: That was in front of 40 people. FRASER: And the whole world was free to turn up. I didn't organise the debate. I didn't set the terms of reference. It was organised by the local Chamber of Commerce and all of the rules were set by them. It was a free and open debate and people could raise questions and issues as you did on the night. Comment: In fact, I e-mailed Andrew Fraser well before the meeting explicitly asking for a debate and drew the implication from his reply, incorrect as it turned out, that a proper debate would be held. Please see correspondence in Appendix 3 below. FRASER: And I acknowledge the point you're making, that I did not rule it out, because we couldn't rule it out, because we hadn't decided what or the way in which we would deal with the challenges of putting together a budget after the election, and that's what we said, clearly. SINNAMON: Before a wider audience - not just the 40 people who were there - that was ignored. There was no further response. There was numerous correspondences between myself and you and Anna Bligh and I got no response further from that. So the whole thing was quietened up. FRASER: James, I replied to your correspondence. FRASER: And I also did, on average, a media conference one day a week during the election campaign, so, the notion that you're putting forward, isn't in fact supported by the facts. Comment: It's hard to be sure what point Andrew Fraser was making here. If he meant to imply that he was too busy to respond to my requests that he defend privatisation during the course of the campaign, it was his own Government's choice to hold such are rushed early election with less than four weeks from the day the elearly election was announced until polling day. Andrew Fraser certainly never took the opportunity at any one of those press conferences to either announce his privatisation plans or at least announce that privatisation was a serious possibility in the coming term of Parliament nor, of course, did any of the journalists ask. SINNAMON: The fact is that 66 per cent of the people felt that they were misled, according to the polls. 84 per cent of the people, according to the polls, opposed privatisation. FRASER: So do you agree then that we should spend Queensland taxpayer money building rail-lines for BHP and Rio Tinto? SINNAMON: I don't think ...I think..
FRASER: Whereas, in Western Australia, those rail lines are built by BHP and Rio Tinto? FRASER: No, no, one fact is in West Australia BHP and Rio build the rail lines and in Queensland, the government does. So, my question to you is, do you agree with that situation? Comment: This is an argument for which I should have been better prepared. The presumption behind Andrew Fraser's question is that the people of Queensland neither the capacity nor the right to earn income by charging companies for the transportation of that coal or for the loading of it onto ships, let alone the right to directly profit from their own mineral wealth or at least what was once their mineral wealth. (Of course whether it is just the current generationd of Queenslanders or this and all futher generations of Queenslanders who have the right to exploit our mineral wealth is anothor issue.) Only if we acceppt Fraser's prmise does his argument stand up. However, If we accept that Queenslanders do have the capacity and the right to earn income by transporting and loading our coal, then clearly an investment by Queensland taxpayers in upgrading that infrastructure would be be a justified expense, just as it would be for any private company. SINNAMON: I don't think it's as simple as that. You are, we are choosing on the one hand, these assets that belong to the public; I put to you in an email on the 31st of July (see Appendix 1) a lot of alternatives to privatisation, one alternative - and I've actually ... I've asked you several times could you please tell me what is wrong with my proposal. FRASER: James, whether you're a private bank or a state-owned bank, you still raise money through the same channels on the international market. FRASER (continues): in the international markets for the use of Queensland government agencies, government owned corporations, and the budget sector. There's no such thing as magic money where you get debt for free. FRASER: So, your solution is more debt, raised in a different way? SINNAMON: Because, it's the way that North Dakota does it. That is the state that is not bankrupt whereas all the other states are done. It's been done successfully in other places. FRASER: But if you just keep raising more money and more debt, without a way of paying it back, then what's your alternative? FRASER: There's a limit, is there not? FRASER: But is there not a limit? SINNAMON: There are limits to how much a state can go into debt. FRASER: And, what would you propose is the limit for Queensland? SINNAMON: We're talking about a difference of $14 billion. And the total number of debt is of the order of $90 billion, so it's not making a huge amount of difference. Anyway, I've sent you my email. What I would like, is from Treasury, a written response as to what is wrong with it, rather than argue it out in this way. I haven't got that. Comment: I have yet to receive a written response to my proposals (see Appendix 1) even though they were originally sent on 31 July, over four months prior to that meeting. FRASER:Well, I do not agree with the principle that you can continue to raise debt without a limit. FRASER: You're just proposing a different way to raise more debt. SINNAMON: A cheaper way. A cheaper way that is done. FRASER: You'd still have to pay it back. SINNAMON: That is right. I didn't say it was cost free. I said it was cheaper. We could have our own state bank. We could raise the finances as a state bank, the same way as any private corporation. It was done in the past, when we had the Commonwealth Bank. It was done in North Dakota. It's probably been done in lots of other places in the world. It can be done that way. If you have a state bank tomorrow, we could do it. Okay, debt wouldn't go away. But it would be cheaper. Comment: Andrew Fraser has not demonstrated that loans could be raised more cheaply through a state owned bank. His argument is the non-sequitur that because states can't borrow unlimited amounts of money that therefore implicitly the additional extra borrowed funds necessary to prevent the fire sale must exceed what he has arbitrarily deemed that limit to be. SINNAMON: (continued from above) The second alternative that you haven't responded to is population growth. Now, my letter from Anna Bligh read, said, that we are paying for ... um... we are selling the assets in order to pay for infrastructure that is necessary to cope with population growth. Now it is the */choice/* of Queensland Government and Commonwealth Government to deliver the greater population. 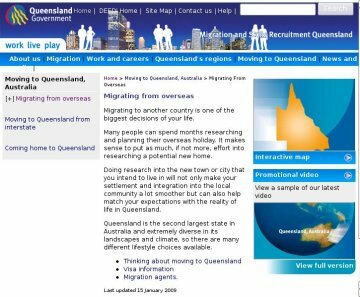 Back in 2005, Peter Beattie put in an advertisement in the Courier Mail newspaper that asked people to move interstate- move from interstate into Queensland. He never told the people that four or five years down the track, we were going to be paying for extra population growth by selling off the family silver. FRASER: Well, James, in fact, the biggest population flows, rather than interstate migration, are, in fact, from overseas migration. FRASER (continues): and secondly from increase in the natural birth rate. And, I do not believe, as a nation, that we need to have Checkpoint Charlie set up at the Tweed River. It's not only unconstitutional; it's unAustralian. Secondly, I don't support having birth limits for Australians who want to start a family and the reality is that population growth is not a pre-determined government policy, but, the challenge is for us to deal with the population flows which are occurring. So we can't stop people from coming over the border from New South Wales and Victoria. The Federal government sets the migration policy. People are free to move about within Australia, and, thirdly, I don't support a population limit in terms of birth limits, so there is a challenge that needs to be dealt with. Comment: This "Checkpoint Charlie" jibe presumes that only two extreme positions can be taken. At one extreme is for Governments to not in any way act to discourage the movement of people interstate or overseas or encourage women to limit the number of their Children. If this extreme is rejected, then the one must necessarily be in favour of the other extreme of brutally coercive meassures to limit population growth and restrict the movement of people into Queensland. See also introduction to Part 3, above. SINNAMON: Both you and Anna Bligh came out after Kevin Rudd made the statement in favour of Australia's population increasing to ... um...I think the figure was 40 million by 2050 or something like that. And it's obvious - the newspapers - every day of the week - are full of stories about how the Queensland government has failed, completely failed to meet the challenge of past population growth. Our streets are a schmozzle. We are being told that our rates and our electricity rates must go up; we must pay more for water, because we have to build more infrastructure to pay for the additional numbers that the Queensland government has deliberately encouraged to come here. Now, if - ah - and then back in - when the auditor general's report came out and you - it slammed the Queensland government's management of health, management of transport, Anna Bligh stood up and said, "It's not my fault, it's the fault of population growth." And yet, when there's a raging debate about increasing Australia's population by another 60 per cent, both you and Anna Bligh came out and publicly said that we can rise to the challenge. FRASER: The reality that we have to face, James, as we said very clearly in the public arena, is we have to make choices. There's not - There's a finite resource out there in terms of the ability to raise debt. You don't accept that; you agree with more and more debt. I don't. That's the starting point to the debate. FRASER: Do you support cutting the migration intake, banning interstate migration, and capping the birth rate? SINNAMON: I say start with stopping international immigration. I say that, if the Federal government is so irresponsible that they want to increase our population by 60 million, then our state governments have responsibility to say, "Hey, we are having to flog off our assets to pay for this." We are ... and we had to find the money to build desalination plants because there won't be enough water for people to drink, if we don't ... I mean ... we need that point of leadership. Now, a few councils, like the Sunshine Coast council are trying very hard to put a population cap up there. The Queensland government is bent over backwards to make sure that that doesn't work. You know, they're over-ruling their ... um... Instead of supporting those councils they are using every possible opportunity, including this advertisement back in 2005 to actually encourage more people to come here. You know, it's clear that the Queensland government has created the problem that it now says it has to solve by flogging off our assets. Which are opposed by 84 per cent under Beatty so that people were never asked about in the first place. They were never asked about population growth. They were never asked about flogging off our assets. FRASER: [Note distortion of terms] I'm happy to have a public debate about whether or not people think we should cap the birth rate orwhether we should put Checkpoint Charlie up at the Tweed River. I happen to think that the community won't support it. And neither do I. And neither does the government. FRASER: That mean's Checkpoint Charlie, and that means, capping the birth rate, and I don't support it. We've got to basically throw the Mary River people off their farms, and so on and so forth. It's just never ends - to pay for population growth. SINNAMON (from before):Now I think that the community are entitled to have those alternatives put to them. FRASER: James, you and I have very different views on this and you exercised your democratic right to stand as an independent candidate in the last election and put those views into the arena. I also stood as a candidate and others did and others are welcome to in the future and I'm happy for the debate tocontinue from here on in, but I don't agree that the propositions you're putting forward are supported by the broader community. SINNAMON: Well, what do you say to the fact that 84 per cent of the people oppose privatisation, and that they felt - 66 per cent felt - that they were misled in the last election? FRASER: What I've said - what I'll say to you - is what I've said all day every day, and that is, we had to make a choice; none of the choices were easy: cutting wages, freezing wages, less teachers, less doctors, less school cleaners, when population's increasing. Or you can make a decision about those things that government has done in the past, but, needs to make a choice about whether we choose to fund new rolling stock and new railway lines for BHP and Rio Tinto or, whether we put it into schools and hospitals and other resources that only governments would provide. We're not selling - ah - the timber business as the whole land ... we're selling the right to mill the trees... They're sold anyway, so they're getting the right to mill the trees. That's what we're proposing to transact there. Those are just the elements of what we are doing in making a decision about doing those things that we need to do ... and those things that are the priorities of government. And, when it comes to it, investing in hospitals, investing in schools, investing in disability services, are all the things that we believe, as a Labor government, ... are the priorities over building infrastructure for commercial interests that are able to do it themselves. That's the essential choice that we had to make and it's the one we made. FRASER: We're not encouraging population growth, we're just dealing with the natural consequences. Comment: See introduction to Part 3 about this claim. SINNAMON: Why not tell the Queensland public that we are paying for the past population growth ...um... with selling our public assets and inall sorts of ways? And why don't you get up and say to the Queensland public that, if this continues, then, what prospect do we have of having anything left in another fifty years time? FRASER: Well, the problem with your analysis, James, is that it doesn't accept the fact that we're proposing to put $15 billion worth of assets onto the market, from an asset base of more than $200 billion... and by the time we finish, the asset base will be over $250 billion. So, this year alone, we're building an $18 billion dollar infrastructure program which supports building the asset base. Now, the debate we're having here is about $15 billion, which represents ... ah... a component of just one year'sinvestment that we're undertaking. So, everything that we are proposing to put to the market facilitates the capital expansion of the state. Building more assets, each and every day, each year, into the future. And that's the bottom line. Comment: If this were true, then it would count as a substantive argument for privatisation. As result of selling $14 billion worth of assets, the Queensland Government's asset base is increased from $200 billion to $250 billion. Part of the reason for this would lie in the fact that more infrastructure assets are needed for Queensland's increased population, anyway. MUch of the money is being openly raised by increasing the charges for services as discussed above, so would not be dependent upon asset sales. All the same the figures Fraser has provided don't seem right and need further scrutiny. SINNAMON: Okay. This letter in the Courier Mail, Friday, said that you haven't yet released the business case for privatisation. When do youintend to do that? FRASER: We've put the rationale into the broader public arena. SINNAMON: The general business case, the actual hard figures that actually show the sort of thing the figures of John - Professor John Quiggin's been asking for. When do you intend to do that? FRASER: Well I debated Mr Quiggin on radio on Friday. SINNAMON: For five minutes. For all of five minutes. Hardly a debate, I would have thought. FRASER: Well, I certainly was ... ah... happy to debate him. The reality is we've had to make this decision and all those ... ah... figures are in the public arena, all the entities have reported as government-owned corporations, and ultimately ... and ultimately, you proposed a different policy and platform at the elections, which didn't gain the support of the people. You're entitled to put your views, James, and I'm entitled to put mine. SINNAMON: Yes, I that's a bit [??vague]. I think that if people realised that privatisation was up for ... was an issue at the last election it would have been a very different story. I don't think you would be treasurer today if people realised that you were going to sell off $14billion of their assets. And I don't think Anna Bligh would be Premier. FRASER: Well, you're entitled to put your views, James, and you're entitled to ... ah... proceed with them. That's your perfect entitlement as a citizen and I respect that. I've allowed you to film and record this interview. Use it for whatever political purpose you like into the future. SINNAMON: Just one other question, Andrew, if you're wrong, if you're proven wrong, and our leaders have been proven wrong every time about privatisation, particularly the privatisation of the retail arm of electricity ... where we were promised cheaper electricity. If you're proven wrong, four or five years down the track, just as the Federal government was proven wrong about privatisation of Telstra, what recourse will they have? How do we get out of the mess that will have been created, that most people believe will happen? FRASER (continues from above): and that what we are doing is the correct thing to do, and that's what's decided to do. FRASER: The recourse as ever, is daily media scrutiny, the parliament, and election. That's the way it's always worked in Australia. SINNAMON: We've had no recourse against Peter Beattie, who sold off the assets against our wishes and we're all paying higher electricityprices. We believe that the same will happen. SINNAMON (continues): What recourse will we have when it all goes pear-shaped, as people believe? FRASER: I'm happy to be accountable for all my decisions, James. FRASER: Well, I disagree with you. You're entitled as a political candidate to put your view and I'm entitled as a political candidate to put mine. SINNAMON: Why won't you hold a referendum on this? People ... 84 per cent of people are against it, why can't people have the final say on privatisation? You haven't swayed me. FRASER: Because we're elected to make decisions. We're elected to make the tough decisions. FRASER: Well, James, you're advancing a contradictory thesis that ... um...that one time you're saying I did say that in the election campaign, and the second time ... the second part of your question is that I didn't. So you need to decide which accusation you're going to make against me and the government. My comment: I am not sure what Andrew Fraser was referring to here. I never conceded that he had been forhtright about his intentions during the course of the elections. What I had pointed out on a number of occasions was that he had not given a categorical assurance that there would not be any privatisations during the course of the elections. That is why I repeatedly asked that he either make that categorical commitment or be prepared to debate privatisation. It is obvious in the electionsThis was a truly bizarre argument that seemed to come from nowhere. My thesis was that the people of Queensland had not been informed of Andrew Fraser's intention to sell $14 billion worth of their assets during the state elections in spite of my repeated earnest requests to both him and Anna Bligh during and before the elections that they do so. As I said in the interview, if they were not prepeared to preclude privatisation during the course of the elections, then privatisation was at stake in the elections and it should have been debated. FRASER: You're a political candidate and you're entitled to your views. I need to progress, so thanks very much for coming along. SINNAMON: Okay, well thank you for your time. The e-mail below is a request that there be a debate between the candidates. I took from Andrew Fraser's reply, that the 'candidate's forum' would be something approximating a debate. It turned out not to be. I was first speaker on the night and given only 10 minutes. No opportunity was provided for me to respond to Andrew Fraser's 'rebuttal' of my arguments against privatisation in my own speech. My many other attempts to get Andrew Fraser to properly debate privatisation and the issues at stake in the elections can be found in "Open letter to Anna Bligh and Andrew Fraser asking that any planned privatisations be put to the public at forthcoming elections" of 17 Feb 09, "Andrew Fraser's three different responses to a question on privatisation" of 17 Mar 09, "Brisbane ABC suppresses alternative candidates in state elections despite listener dismay with major parties" of 30 Apr 09. As an Independent candidate for Mount Coot-tha, I would like to have the opportunity to debate all other candidates standing for election before the electors of Mount Coot-tha. I believe that this would give voters the best possible opportunity to decide which of us is the most suitable candidate. I think it should still be possible, even given the time constraints (which I personally believe to be unnecessary) to find a suitable public venue for the debate and to organise a meeting. I also think it would be worthwhile to engage in online debates. I suggest an online forum be set up for the Mount Coot-tha electorate. Pro-democracy independent candidate for Mount Coot-tha. Thanks for your email. It has been past practice that the Brisbane Inner West Chamber of Commerce has hosted a candidate forum. I have already been approached, and I understand the Chamber is again proposing to approach candidates for participation in such a forum. I propose that, once again, the Chamber host such an event. I've forwarded your email to Lynne Brown of the Chamber, who is coordinating the time and place. Anna Bligh's and MPs pay rises? State MPs, including Anna Bligh, will get a 3.1 per cent pay rise on their base salary from next month and a 2 per cent increase in allowances. This generous rise is a parliamentary privilege that is denied to the great majority of us! Surely if the State can afford such pay rises then privatisation isn't necessary. "The question of wage restraint is important when we're enduring some tough economic times," she said. However, the "wage restraint" needed doesn't include the MPs who are responsible for the "tough economic" times but don't have to exercise the restraints! Teachers have had pay rises too. How interesting. MPs had a pay freeze for a mere 2 years, and now they have their snouts in the trough. She has made mistake after mistake and the Traveston dam fiasco has left people hurting. "Ultimately this (pay rise) has little or nothing to do with the Government's other Budget decisions like asset sales", says Bligh. However, privatisation will not only reduce wages due to private competition but outsource jobs and apprentices as it did in Victoria. Maybe if she capped population growth they would save money spent on infrastructure. It could simply be done by not allowing any more land subdivisions. The Queensland Premier yesterday announced she would lead a trade mission to the US to attend the G'Day USA industry promotion. She will "aggressively promote opportunities for Queensland in the world's biggest economy as it starts to emerge from recession". What about she stays in Queensland and tries to save public assets for the public and listen to the concerns of the people? Surely there is money still in Queensland's coffers if it has the "world's biggest economy"! However, in one sense, their pay rise may not seem so generous. In recent decades politicians like Bligh, Beattie, Rudd, Howard, Keating, Hawke, etc. have changed the Australian economy so that much of the wealth has been transferred to the wealthy. Consequently salaries of private sector managers have gone up considerably more than those of politicians. But that is no reason to increase politicians' salaries, It is cause to reverse those past Government policies and transfer the wealth back out of the pockets of the wealthy. Last September Federal politicians awarded themselves a 7% pay rise. The Rudd Government on 12th October to combat the global credit crisis announced it would guarantee all bank deposits held with Australian financial institutions for 3 years. It did this unconditionally with the banks at the time deposits in Australia tally totalled about $700 billion. Commonwealth Bank CEO Ralph Norris has a nice earner of $9.21 million, ANZ CEO Mike Smith gets $10.9 million a year, while NAB CEO gets a measly $5.2 million a year. Then Wespac last week doubled the Reserve Bank's interest rate increase to boost profits. Meanwhile, on the other side of town, The Poverty Lines for the June Quarter 2009 as recorded by The Melbourne Institute of Applied Economic and Social Research is $761.69 per week (inclusive of housing costs) "for a family comprising two adults, one of whom is working, and two dependent children." [16 September 2009]. Five years ago, an Australian Council of Social Services report found that 9.9 per cent of Australians, or nearly 2 million people, fell below the international poverty line in 2004. I wonder what the 2009 figure is? Last month the ABS reported Australia's unemployment rate at 5.7 per cent, which translates to the seasonally adjusted number of people unemployed at 653,100. Our once envied Australian value that distinguished us from other countries around the world, most notably from Britain, was that Australians regarded themselves as a 'classless society'. Clearly, the evidence is that this is no longer a feature of Australian society. The above figures demostrate that we have become and allowed our society to become highly inequitable... and I haven't even mentioned the inequity faced by our indigenous peoples.